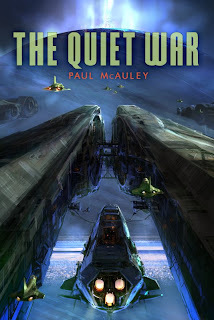 Just in from PYR Books, a reminder that one of the best hard sf space operas of recent time, The Quiet War by Paul McAuley is finally coming to the US. Another non-traditional space opera milieu, this time with Greater Brazil in alliance with the European Union and the Asian Sphere on the top, and with perspectives both from Brazilian characters and Solar System colonists, this made my top five sf novel list of last year and its sequel Gardens of the Sun is a highly anticipated novel for 09. Look for more related material here in days to come since this is one of the most major US sf releases of 2009. While the official publication date is September 15, 2009, the novel should be available sooner as Pyr books are usually. “Shortlisted for this year's Arthur C. Clarke Award, this sweeping interplanetary adventure is also a thoughtful examination of human nature... McAuley…moves deftly among five well-drawn characters in the thick of the action: a cloned spy, a hotshot pilot, a ruthless scientist, a bluntly independent biological engineer and an unscrupulous diplomat. They all, in different ways, must choose between the familiar and the new, struggling to reconcile conflicting desires. This compelling tale opens vast panoramas while confronting believable people with significant choices.” --Publishers Weekly Starred review! Twenty-third century Earth, ravaged by climate change, looks backwards to the holy ideal of a pre-industrial Eden. Political power has been grabbed by a few powerful families and their green saints. Millions of people are imprisoned in teeming cities; millions more labor on Pharaonic projects to rebuild ruined ecosystems. On the moons of Jupiter and Saturn, the Outers, descendants of refugees from Earth's repressive regimes, have constructed a wild variety of self-sufficient cities and settlements: scientific utopias crammed with exuberant creations of the genetic arts; the last outposts of every kind of democratic tradition. The fragile detente between the Outer cities and the dynasties of Earth is threatened by the ambitions of the rising generation of Outers, who want to break free of their cozy, inward-looking pocket paradises, colonize the rest of the Solar System, and drive human evolution in a hundred new directions. On Earth, many demand pre-emptive action against the Outers before it's too late; others want to exploit the talents of their scientists and gene wizards. Amid campaigns for peace and reconciliation, political machinations, crude displays of military might, and espionage by cunningly wrought agents, the two branches of humanity edge towards war . . .